Fireplaces aren’t only used to keep homes warm when outside temperatures plummet. They’re also used to create cozy, toasty environments and, essentially, transform houses into homes. If your home doesn’t have a fireplace, you don’t need to spend tens of thousands of dollars to have a chimney installed. Instead, you can turn to 31-W Insulation for a direct-vent fireplace from FMI. 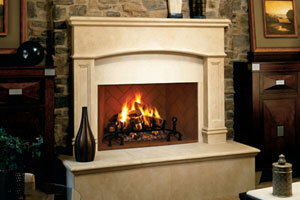 And, FMI’s fireplaces stand apart from many other no-chimney models. FMI’s products are powered by natural gas or propane – not electricity – so they’re the perfect source for emergency heat during power outages. Plus, they’re specially engineered to be incredibly energy efficient, so you can enjoy all the benefits of having a warm, welcoming home without the worry of sky-high energy bills. Perhaps best of all, FMI’s fireplaces use gorgeous concrete logs that are painstakingly hand-painted to replicate the appearance of authentic wood logs. To learn more about FMI’s direct-vent fireplaces, contact 31-W Insulation today to schedule a complimentary consultation. We proudly serve homeowners in Texas, Tennessee, Ohio, Oklahoma and surrounding states in the South and Midwest, and we offer a multitude of home remodeling services, including the installation of garage doors, attic insulation, gutters, custom closet organizers, and more.